Looking for online guitar lessons, huh? Free? No problem. Today we’re going to talk about playing chords with notes other than the tonic in the bass – also known as “slash chords.” There is a very simple rule to understanding slash chords. The first note is the fundamental chord, after the slash is the bass note. 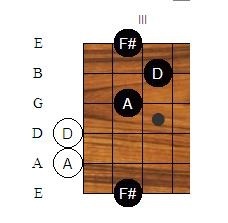 So for instance, a D/F# is a D major chord with an F# in the bass. 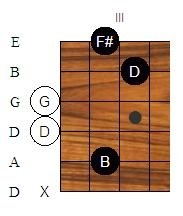 The two most common methods of voicing a non-tonic slash chord use the 3rd or the 5th in the bass. Now, here’s a D/A. Same bass note principle applies. Do you hear how much more full the chord sounds when strummed? Notice how you can play an alternating bass bit? 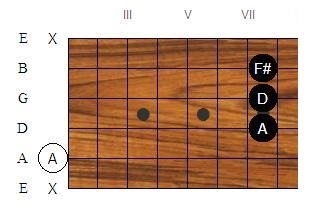 Here’s another way to play it (at the 7th fret), which gives extra emphasis to the 5th. 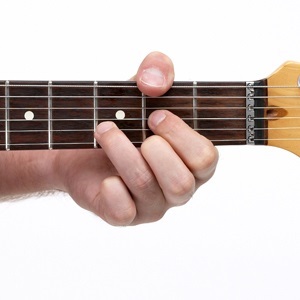 I personally like playing from this position with this particular chord shape – it’s a great place to jump off. 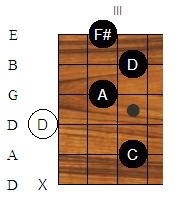 (Note: The following tab and chords are in Drop D tuning – D-A-D-G-B-E). 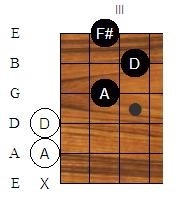 And to close out the lesson, here’s the last chord of the “Dear Prudence” riff, which, again, could be three different chords, A# aug6, Gm/maj7/A#, or D aug add4/A#. 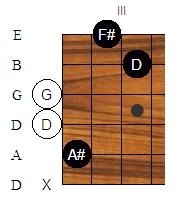 If you choose to omit the F#, it becomes a Gm/A#, which is a brilliant chord, by the way. As with everything guitar-related, feel absolutely free to mess around and experiment with these chords.